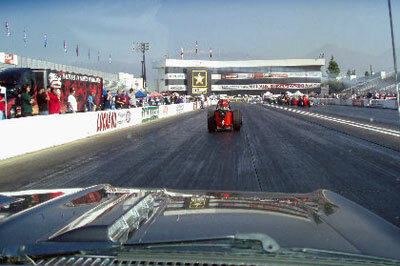 The 40th NHRA World Finals, held at Pomona Raceway on November 11-14, 2004 served as a specular format for Big Yohns Racing, their Shubert & Herbert recreation and other legends from drag racing history. 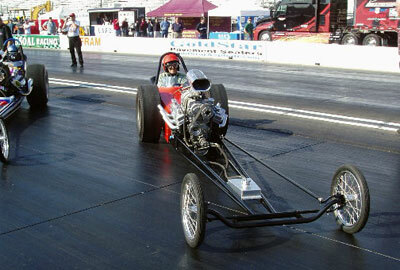 This was the last of 24 races in the 2004 season of the NHRA Drag Racing Series. As always, the World Finals puts a period on a season and draws huge crowds getting their last nitro fix until the Winternationals. This year was no exception but there was even more "butts in the seats" because of the "bonus show" sponsored and organized by the folks from the Wally Parks NHRA Motorsports Museum. 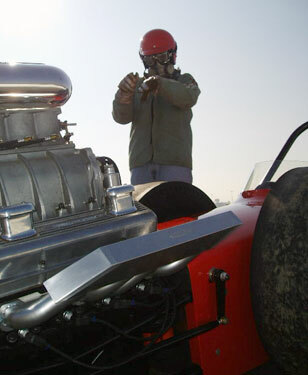 A huge display of over 30 vintage race cars and exhibition runs by some of the best Nostalgia Top Fuel dragsters and Fuel Altereds in the world brought out folks who would have passed on the "Big Show" by itself. Wednesday was the High School mechanics Show and Tell at at Pomona and I left home at 6:00 A. M. to get there in time. Shubert/Herbert is pretty much done, the tow car is pretty much done and now the trailer is pretty much done. 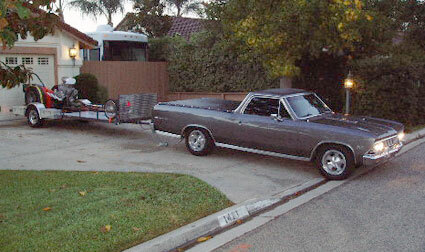 This was the first time the El Camino was hooked up to the completed trailer, and with Shubert/Herbert atop. The "Big Show" cars were just starting to set up their zip code size pit areas while a hand full of volunteer Cacklecars were putting on a show for thousands of school kids who were guests of NHRA and the US Army. Why is this a good thing? There wasn't a person in the stands that was born - even thought about - when these cars were racing. 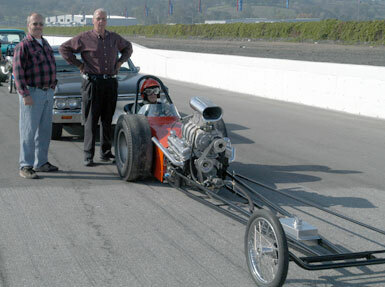 These appreciative young adults got a birds eye view of drag racing history. 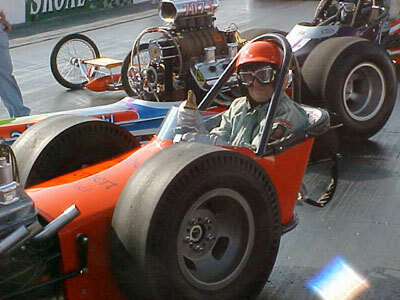 "What do you mean, dragsters used to have the engine in FRONT on the driver!". El Camino and Shubert & Herbert in wait. For this affair, Big Yohns Racing crew chief, Marc McCormick got the seat. My suit fits Zane pretty good, but no way would Marc be able to wear it. They wanted vintage stuff, so Marc borrowed Dennis Plater's fire suit jacket. That along with my helmet, goggles, gloves etc. finished Marc off. All he was missing was spats! You youngsters have no idea what spats were, do you? I'm not going to tell you, look it up with Google! Ron and son Kol behind car. We were a little late getting there (bad traffic from San Diego) and we didn't intend to pre-fire so we simply expected the car to light up on track, as needed. You all know how this kind of expectation can lead to disappointment! But, Shoobie (short for Shubert/Herbert) was as nice as pie and fired right up, idled perfectly and was a real gentleman for Marc's first cackle. Perfection. Marc gives the "thumbs up" after his first push start - first cackle. Yea, he dug it! As you can see, we haven't changed the fuel tank yet, it's still only about two gallons. But with the 15% Nitro load we are running currently, and the barrel valve leaned out some, it ran quite a while. In fact we ran until only Kuhl and Ewald were left running, trying to burn each other down. Sunday was another deal entirely. There were going to be about 25 cars lined up, backed against the safety wall at track edge, facing the grandstands and we would all fire up together. 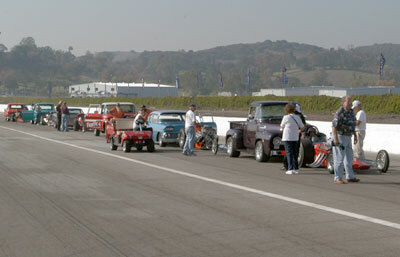 We lined up behind the grandstands at the tunnel where the cars return to the pit. Then we waited! On the way up there, I dashed over to Doug Herbert's pit area and boldly interrupted him while he was talking to his crew. I quickly explained that we were only a couple of hundred feet away, with the car his dad ran in 1965 and we would be delighted if he would come over and take a look. He very graciously accepted my offer and said he'd be over there as soon as he could. Within about five minutes he was there. I had gone up to the head of the line and wasn't there when he got there. I returned just in time to grab my camera and snap this shot of Doug in the car. He's a good sized fellow, about my height, but much trimmer than I. He dropped right into the car and got a pretty big smile on his face. We'll be seeing him again, you can count on it. While we waited for our time, as we got close we were told to get everything ready, so Zane hopped into the car and got situated and we hooked up battery cables and got everything ready to fire. This time, we had pre-fired back in the pits and made sure our combination was going to be okay. We tried for the first time, to start the car with the biggest Odyssey 12 volt battery. We had been using our race car battery box, which is a 6 and a 12 volt Ultima making 18 volts. It does great, but it's so heavy that with my Doctor imposed lifting limit, I can't move it. The Odyssey weighs only about 25 pounds and is a piece of cake for me. It worked fine, although the long cables sapped some oomph and it was kind of lazy turning over. We have since shortened the cables from 12 feet to 3 feet. Zane Shubert ran the "Shubert & Herbert" car dry. It was really fun to see Zane with such a sparkle in his eye, and now that the medical reports have come in, that he is, indeed, Cancer Free, he is enjoying himself a great deal. He had his stepson, Kevin Corbett, with him. It was the first time I had met Kevin and I think it was probably the first time he had seen Zane in a race car. I think it was an enjoyable experience for both of them, so that it was more special yet for all of us! Well, this is probably the last function for 2004. 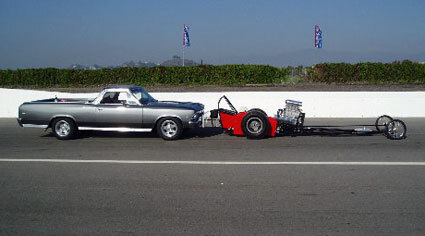 I still haven't really figured out how much the car and trailer cost. I don't think I will work on that any more, I already know more than I need to about it. But, was it worth it? Yes, yes, You Bet! The existence of the car has had a profound effect on some people besides me. 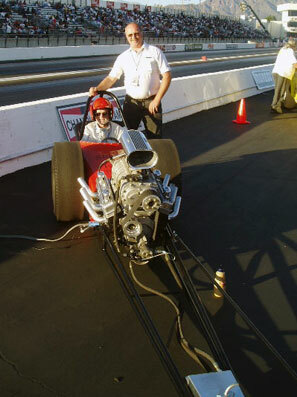 It is much more satisfying than the Street Rod than I had prior to the race car. I was concerned that the ownership experience of Shubert/Herbert would be like that was. The car was a nice 32 Ford Victoria, previously owned by Andy "Rodfather" Brizio and his wife Sue. I always felt "flat" when I took it to a cruise or car show or whatever. It was nice but few if anyone but me cared. 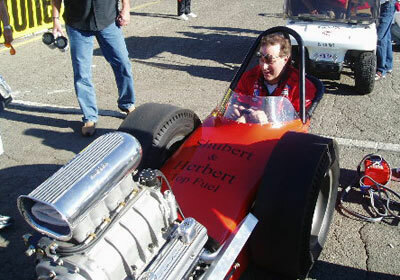 With Shubert/Herbert, each outing is an adventure and the response of the people who look at it and touch it is so different than the Street Rod crowd. Taking nothing away from them as people, but for the most part they're just not racers and race fans. I didn't fit there, I do here. Kol has been in it with the motor running, Marc has, Zane has, Ronnie Goodsell has. My turn next! 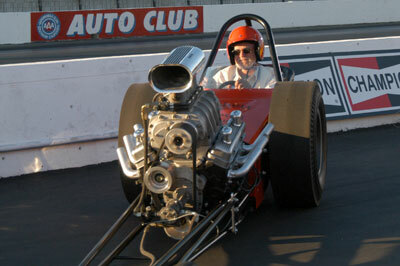 I have never been in the seat of a Nitro burner with the motor running. It's about time, don't you think?